SmartShares is an excellent way to invest in low-cost, diversified ETF in New Zealand. Especially if you wish to invest in the top 500 companies on US stock market. Smartshares S&P 500 ETF (USF) is a great option for all investors as it is simple to understand, the management cost is low at 0.35% and has a long positive track record. I’ve been getting questions on how to start with investing with various investment service I covered and the most of the questions on Smartshares. So here is the guide on Smartshares. Let’s set the right expectation here, its gonna take a LONG time to set up a monthly contribution plan with SmartShares. For average Kiwi investor (without any connection to politician or United State), will take about 2-5 days to set up with most investment services. However, with SmartShares, you will have to spend around 27-53 days. Yes, that is not a typo. Just make sure you are prepared for it. We are going to walk through the setup process for an individual investing $500 into S&P 500 ETF with a $50/months contribution. Before we start, you will need to prepare the following items. 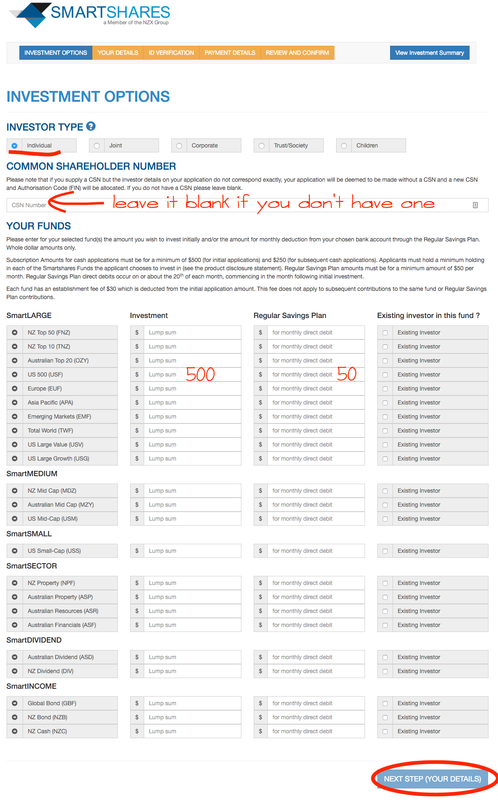 Under investment options, select “Individual”, leave it blank on “Common Shareholder Number” if you are a new investor. Put $500 (minimum) on US 500 (USF) investment and $50 (minimum) as regular saving plan. Next page is your personal information and email address. That email address will be your main point of contact. You will receive an email during the set process to confirm your email address. Next is your ID verification. Put in your NZ Drivers license details. Next, confirm your payment details with your bank account no. Please make sure you have enough fund at 20th of each month. Next part you will have to review your information and confirm your contact email with an authentication code. Here is the authentication email with the code. 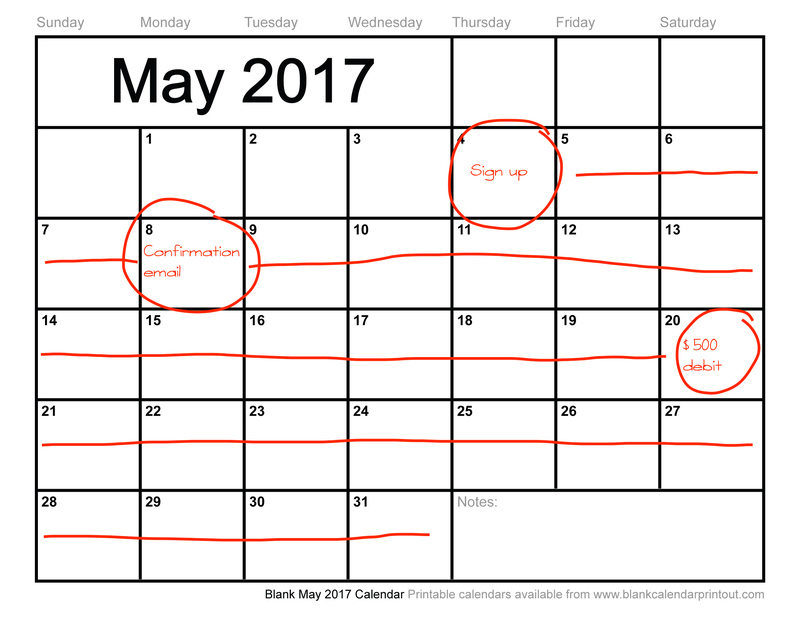 Once you completed this process, you are done with the sign-up. The next part is the long wait…. The SmartShares signup process is straightforward and painless. However, investors need to wait a long time to check up on their holding. 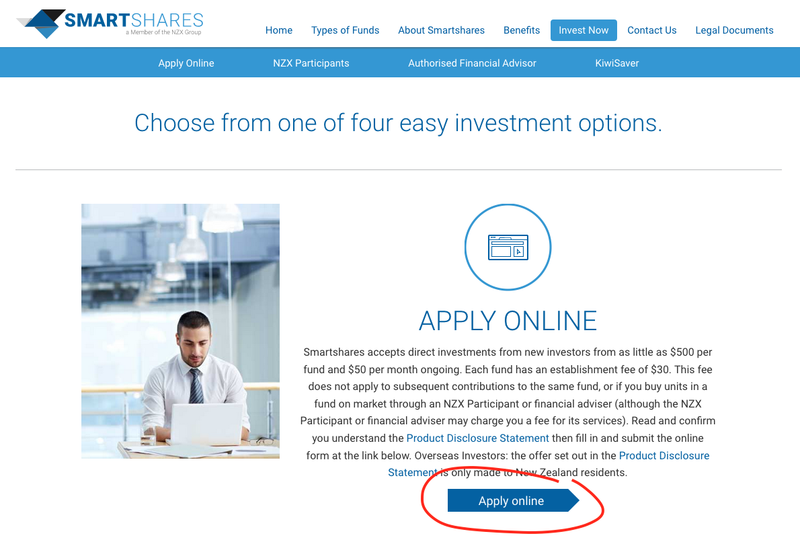 An investor cannot log on to SmartShares to check their holding. SmartShares will direct investor to use Link Market Service to do that. To register for Link Market Service, you will need two pieces of information: FIN (Faster Identification Number) & CSN (Common Shareholder Number). 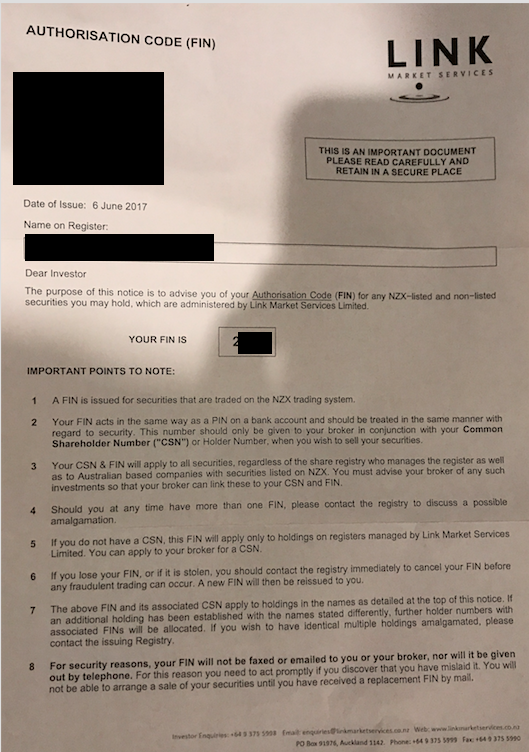 FIN will send to you by mail (physical letter), and CSN will be on your holding statement in an email. You will need those two numbers to prove you own those stock. Check out this page from ANZ Securities on what is FIN and CSN. So here is my timeline on signing up with SmartShares. 4/5 – I submitted my application on SmartShares website. 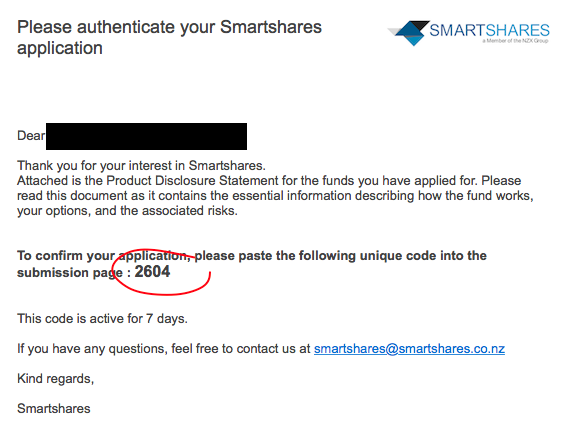 8/5 – I got a confirmation email on my SmartShares application and my direct debit. 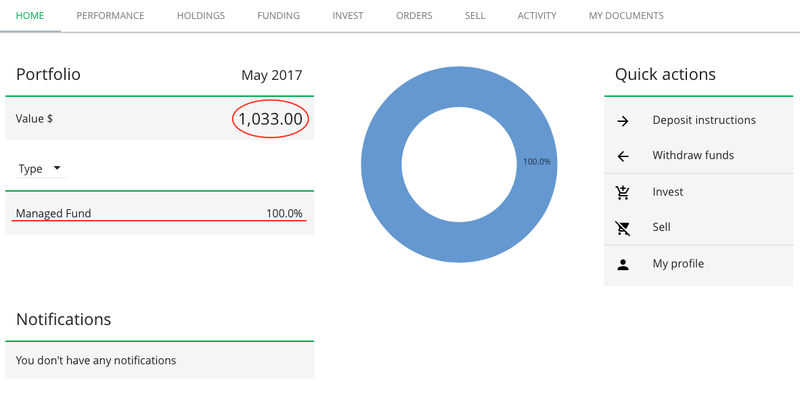 20/5 – $500 initial investment withdraw from my account, and it supposes to make the purchase at the beginning of June. 7/6 – a letter came into my mailbox with the FIN number. I still can’t log onto Link Market Services because I don’t have the CSN number. 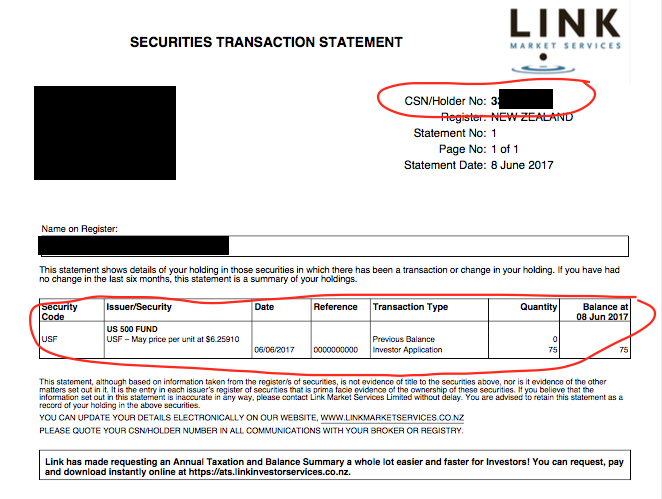 12/6 – got an account statement from Link Market Service with my CSN number. I managed to log into Link Market Service and check out my holding. Yeah! So it took 39 days for me. To be fair, I can submit my application on 12/5 or 13/5, it will still make the 20th direct debit cut-off date. So you can shorten 7-8 days there. On the other hand, if you submit your application right after the 20th cut-off date, you will have to wait over a month. 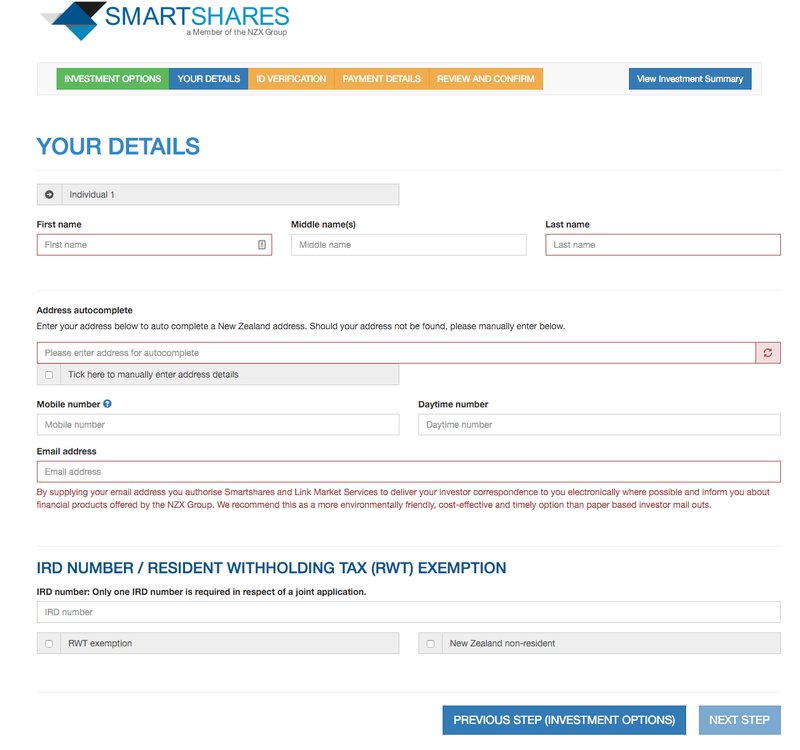 Smartshare is NOT an investment service or fund manager. They are an ETF issuer. ETF is not an investment fund; they are tradable shares. Usually, you will have to set up a brokerage account and pay a fee to buy shares in New Zealand Stock Exchange. The minimum is $30/trade. SmartShares offer a service allow investor buy shares in a small amount monthly without paying a brokerage fee. If I have to do it in the with a stock broker, it will cost me at least $360/year on brokerage fee alone. I am happy to wait a couple of days to save $360. If you don’t want to wait that long, you can open up a stock brokage account and buy SmartShares directly on the stock market. It will take 2-5 days to set up a brokage account, and it will cost at least $30/trade. Hope this blog will set an expectation for you when you sign up SmartShares. Don’t be panic when they took your money for 2 weeks without any communication. 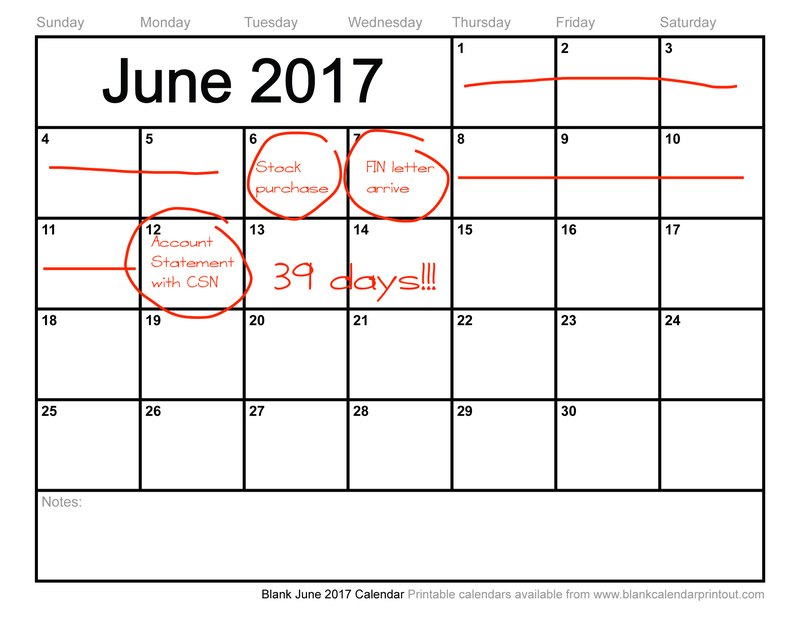 Your FIN and CSN will arrive…eventually. ETF and Index Fund are simple, low-cost and diversified investment option with a positive result in the long term. It plays an important part in my plan to achieve financial freedom by only do a few smart things and nothing much else. To put my money where my mouth is, over 90% of my investment is in ETF and Index Fund. I believe everyone should have at least some investment in those products. 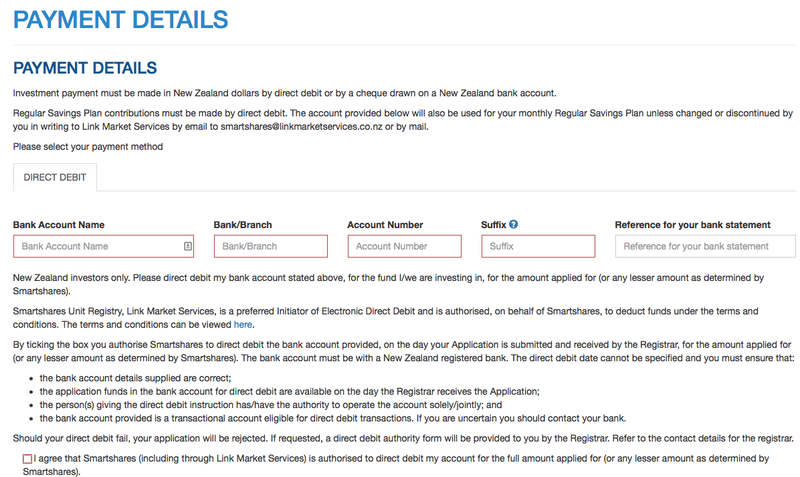 SmartShares, SuperLife, Simplicity, and InvestNow are the four investment services in New Zealand that I am currently using. Here is a breakdown of them. 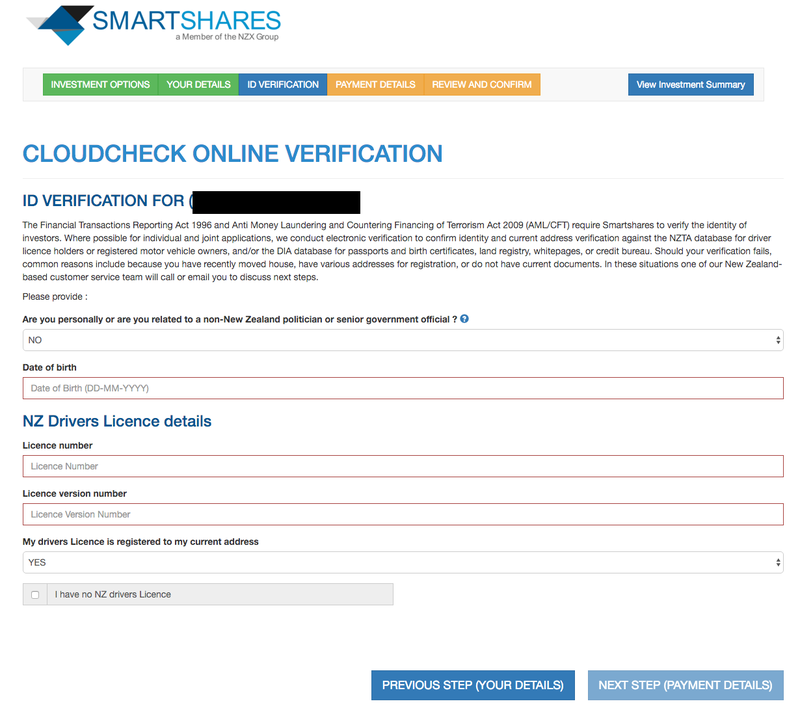 New Zealand Stock Exchange owns SmartShares. 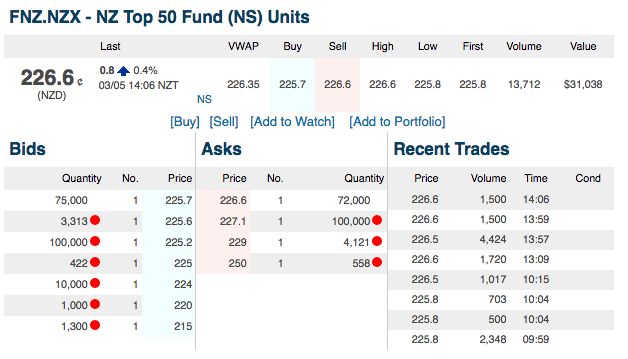 They issue the ETF for local share markets such as NZ Top 50 (FNZ), NZ Top 10 (TNZ), NZ MID CAP (MDZ) and NZ Bond (NZB). They also repackage ETFs and index funds from overseas to sell to New Zealand investor. Those ETFs cover Austraila, Europe, Asia Pacific, US, emerging markets and world markets. You can check out the list of offering here. The most popular overseas ETF is US 500. It tracks the top 500 companies on US stock example, most of them are top international corporations. Some people have mistaken SmartShares as an investment service provider but in fact, SmartShares is an ETF issuer. Their job is to manage and issue ETF for New Zealand stock exchange. 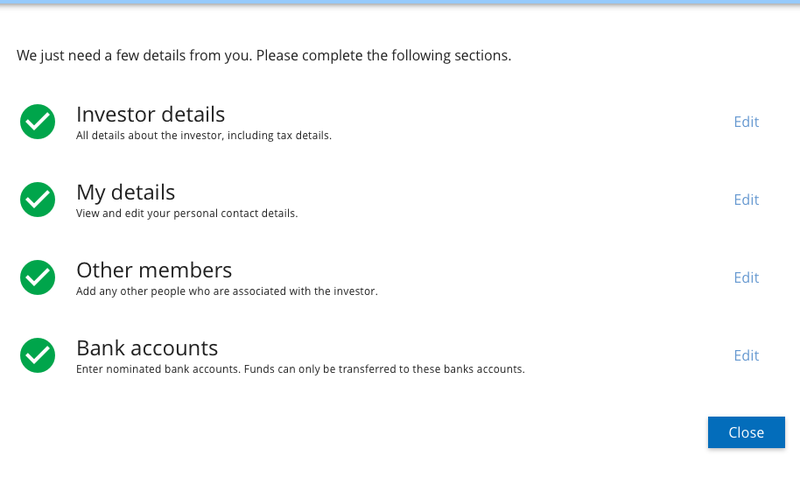 That’s why investor can’t log onto SmartShares site for track their holding because they are not managing the holding for you (hence there is no annual admin fee). If you invested in their ETF, you are basically buying a share on the share market. You can but those ETF directly on share market if you wish. SmartShares will direct investor to Link Market Service to register and track their ETF holdings. An investor can track their holding on other services like ASB securities, ANZ Securities or Share Sight. 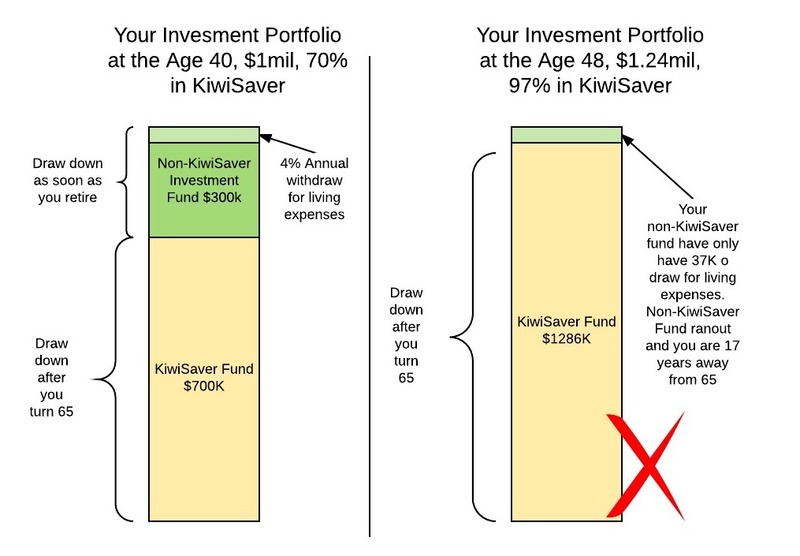 Superlife offer the most ETF and Index Funds investment options in New Zealand. They not only offer SmartShares ETF in fund format but also provide managed fund and sector fund options for the investor. All of those funds invested in a passive index fund or ETF. The Sector fund cover different country (NZ, AUS, Overseas), industry (Property, Shares) and investment vehicle (Cash, Bond, Shares). Those are great options to build your own balanced and diversified portfolio. The Managed Fund is is a grouping of financial assets such as stocks, bonds, and cash equivalents. The nature of those financial assets can be classified into two groups, income asset, and growth asset. Income asset includes cash and bond. They tend to carry lower risk levels and, therefore, are more likely to generate lower levels of return over the long term. Growth assets are shares and property. They tend to carry higher levels of risk, yet have the potential to deliver higher returns over longer investment time frames. Superlife managed fund has different names, like SuperLife 30 or SuperLife 80. The number at the end show the target portion of growth asset in that fund. Superlife 30 will aim to hold around 30% of growth asset and 70% of income asset in the portfolio. So this fund is a low risk (or conservative) fund. On the other hand, Superlife 100 will aim to invest 100% into the growth asset. So the risk is high. Here is a breakdown. SuperLife offer the most options, functions in the breakdown. The entry requirement is basically nonexistent, and the cost is relatively low. That’s why I recommend the beginner to start with Superlife. Simplicity started as a nonprofit KiwiSaver provider. They provide low-cost KiwiSaver options to New Zealander while donating 15% their income to charity. 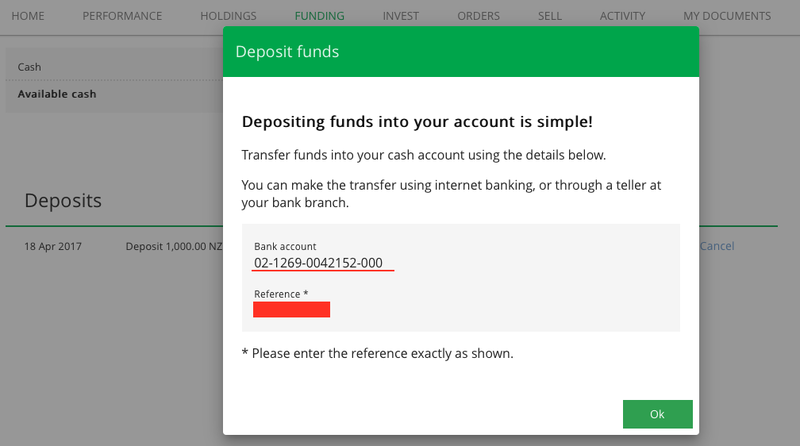 Simplicity recently opened up their investment fund as non-KiwiSaver options as investors can deposit and withdraw their investment anytime they want. Simplicity only offers three managed funds as conservative, balance and growth fund. The majority of Simplicity fund invested in Vanguard’s funds or ETFs. The management fees are the lowest in New Zealand at 0.31% for managed fund. However, the initial investment requirement is $10,000. InvestNow is a new online investment platform. Investors can directly invest into the selected fund on their platform with as little of $250. InvestNow does not charge any transaction, admin, setup or exit fee at this stage. Investor only needs to pay the management fee on an individual fund. The biggest advantage of InvestNow is to allow the investor to directly invest into two Vanguard index fund in Australia. They are Vanguard International Shares Select Exclusions Index Fund (currency hedged and non-hedged version) with management fee at 0.20% and 0.26%. Those two funds are not PIE fund, means you will have to do your own tax return. For under 50k holding, you will only have to do tax return on dividend received, which is not that hard. You can check out the detail in this blog post. 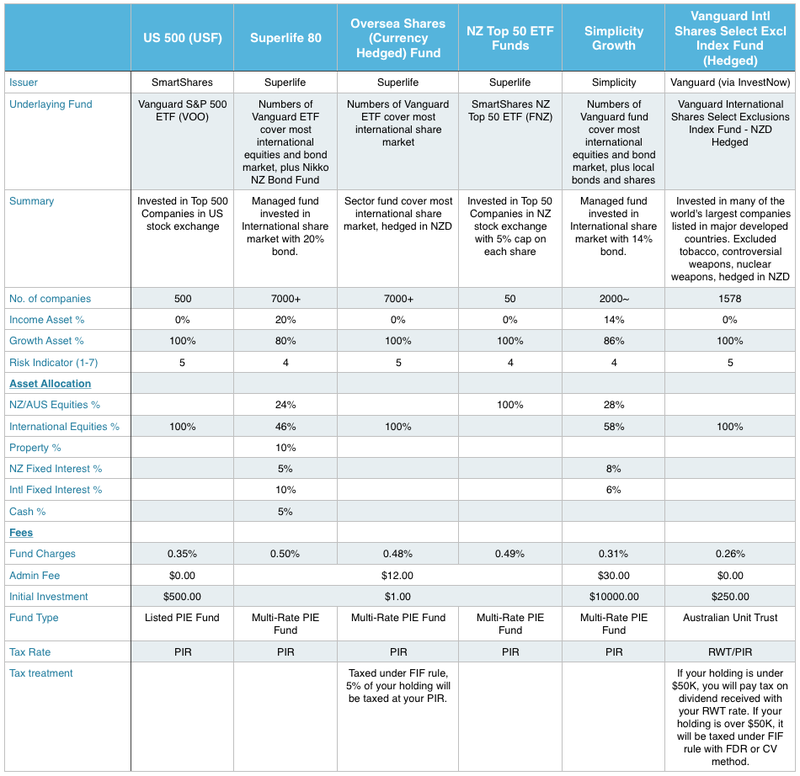 I picked a couple of index funds and ETFs from each provider and made a comparison. Here is the breakdown. As you can see, most of the option’s underlying asset are Vanguard ETFs and Index Fund. That’s basically what I am trying to do on my international exposure, putting money into low-cost Vanguard cost for long term. Accurate description of my international investment strategy. Superlife have the most function, investment options and easy to start. Also, have the lowest cost aggressive managed fund in NZ. It is great for both beginner and experienced investor. Simplicity has the lowest cost managed fund in Conservative, balance and growth area. Great for anyone with $10,000 to start investing. 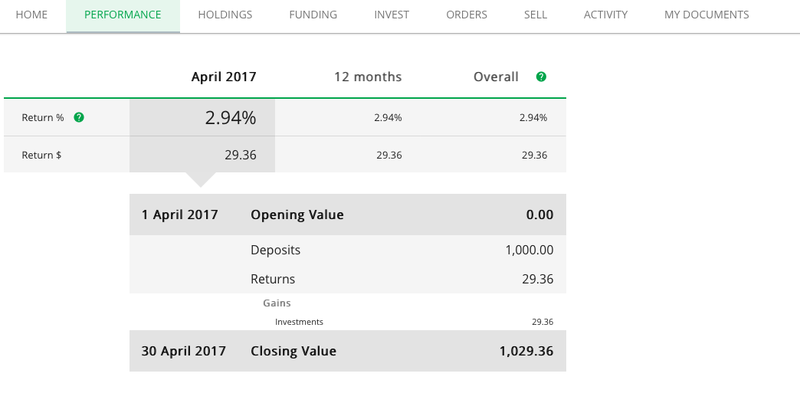 InvestNow user can easily invest in Vanguard index fund in Australia with 0.20% – 0.26% fee. Great for someone who can handle their tax return on dividend received (not that hard) or calculate under FIF rule. SmartShares is good if you wish to buy ETF on the share market. There are other ways to invest into a passive fund and ETF in New Zealand, like ASB Investment Fund, AMP, and Lifestages. However, the cost of those funds is quite high compared to these four services, which defeat the purpose of low-cost passive investing. New Zealand investors can buy Vanguard ETFs on Australian Stock market. The management fee can go as low as 0.04%. I will go into that later once I’ve done it myself. In the past, I recommended to start your ETF investment with SmartShares then switch to Superlife when the fund hit a certain amount. The main reason was Superlife charge a $12/year admin fee, it will cost more in terms of percentage for beginners with a small amount of investment. However, that calculation ignored the $30 one-off initial fee, the cost of setting up extra funds with SmartShares and the exit cost. Let’s look the following example for an investor started NZ Top 50 ETF with $500 initial investment and $50/month contribution for 5 years. NZ Top 50 ETF 5 years annualized return is 16.49%. I’ve put it in a simple simulation to compare investment between SuperLife and SmartSharesand for 5 years. You may already know you need to start investing for your future, but you have no idea where to start. There are so many options out there like the sharemarket, investment property, P2P lending, the bond market, active and passive fund, etc. You have no idea which one is the best for you. Well, I don’t know what is best for you because everyone’s situation is different. However, I think it’s better to start somewhere rather than sit here and do nothing. People say, “you need time in the market, not timing the market” or “The earlier you start the better”. I believe both of them are true. So, here is my suggestion on where to start your investment. Before you jump into the world of investing, you need to have a solid financial foundation. Here is what you should do. Pay off your consumer debt like credit card balances, personal loans, store credit, overdrafts and hire purchases. It doesn’t make sense to chase for 6-7% return on investment while paying 19-22% interest on your credit card debt. Join KiwiSaver. KiwiSaver is one of the best investments available in New Zealand because of the employer contribution and member tax credit. You will have an instant risk-free return on your investment. Live on less than you make. Naturally, no one can become successful with their money without first learning how to live on less than they make. Where will you get the money to invest if you live paycheck to paycheck? You should have a plan for your money before you start investing. Failing to plan is planning to fail, right? That why in my previous post I said the first thing you’ll need to work out is how long can you leave the money in the investment? Or how long before you will need to use that money? On the other hand, I know how hard it is to come up with a plan when you don’t understand most of the investment terms. It’s hard to learn something from the outside when you don’t have personal experience. You may be afraid you will make a mistake and lose your hard-earned money. I also understand how busy life is and how lazy we are (Well, at least how lazy I am). It took me six months to finally put down some cash into an investment. I kept making ‘plans’ and doing ‘research’ for my investments (actually I’ve been putting it off because I am lazy). I started looking into investment strategies on the Internet in April, but I looked around without making any decisions for 4 months. I remember I found out about Smartshares and SuperLife and decided an index fund is the way to go in August, but it still took me two more months to pick which fund or ETF to invest in. Who knows if that is analysis paralysis or just laziness paralysis? It may be just me, but I know lots of people are in the same boat, especially the beginners. You know you need it start investing, but you don’t have a complete plan yet. So you wait. To those people, hear me out! If you don’t have a plan, just start without one. I am not talking about putting in your life saving without a plan. I suggest you dip your toe in the water. Just put under $500 into an investment and get it started. TODAY! That small amount of cash should not affect your financial situation (if that is a problem, you should make sure you have a solid financial foundation). You should be able to move it quickly to start a small investment. You may not even care if you lost it, so you don’t need a plan for that small initial investment. You can put it in almost any fund as the start of your investment. The most important thing is to get you started on something. Once you dip your toe in the water, you’ll have a personal stake in the investment. Looking at the value go up or down will motivate you to know more about investment. It will help you put together a plan for your investment. No minimum investment requirement – You can invest by making regular or lump sum payments to the scheme at any time. There is no minimum contribution amount. Passive Index Fund – All investment fund with SuperLife are passive index funds. They either invest in a fund designed to track an index or in a number of assets for the long term. It is a cost-effective and diversified investment opinion with a proven result. Low cost – The annual admin fee is $12/year (or $30/year if you want paper documents) which covers all fund in SuperLife. The management cost on each fund is around 0.39% – 0.94%, fees for the most popular funds is around 0.49%. SuperLife’s fees are relatively low in New Zealand standard(2nd lowest in the country), and some aggressive funds and sector funds have the lowest cost in New Zealand. There is no joining fee, exit fee, and no cost for you add/close/or switch funds. Flexible – SuperLife provides 40 different investment products on managed fund, sector fund and ETF. An investor can invest in a single fund or multiple funds with their own asset allocation. You can switch fund allocation on SuperLife website. Web Site and App – Investors can log onto SuperLife website to check the performance and value of their holding. They’ve also got an iOS and Android App for that. Simple Tax – SuperLife’s investment fund is a portfolio investment entity (PIE). The amount of tax you pay is based on your prescribed investor rate (PIR). SuperLife will pay the tax from your holding, and you don’t need to manage your tax return. Lots of functions – Investors can make lump sum investments or regular contributions with direct debit from their bank account. You can organise your portfolio and allocation your contribution into different funds based on your preferred percentage. SuperLife can auto rebalance your portfolio, which is a great tool for the investor who wants to build a portfolio with their own asset allocation. It can also reinvest your dividends. Owned by New Zealand Stock Exchange – NZX is New Zealand stock market operator. They 100% own SuperLife. In my opinion, this makes SuperLife a very safe company. For those who don’t have a plan and want to start small and test it out, here are a couple Funds/ETF in Superlife I think are ideal for beginners. SuperLife Age Step: This is a managed portfolio invested in multiple Vanguard ETF in both income and growth assets. The ratio between income and growth assets depends on your age. When you are young, over 90% of that portfolio is invested in growth assets (shares and property). It will increase the ratio of income assets (Bond and fixed income assets) as you age. If you join at 28 years old, 80% will be in growth assets, and 20% will be in income assets. On the other hand, if you join at 58, 60.5% will be in growth assets, 30% in income assets and 9.5% in cash. This is a great fund to start especially if you aim for retirement. You can basically set it up and forget about it for decades. The management fees are 0.45%-0.52%. NZ Top 50 ETF: This growth asset ETF is the same as FNZ from SmartShares. 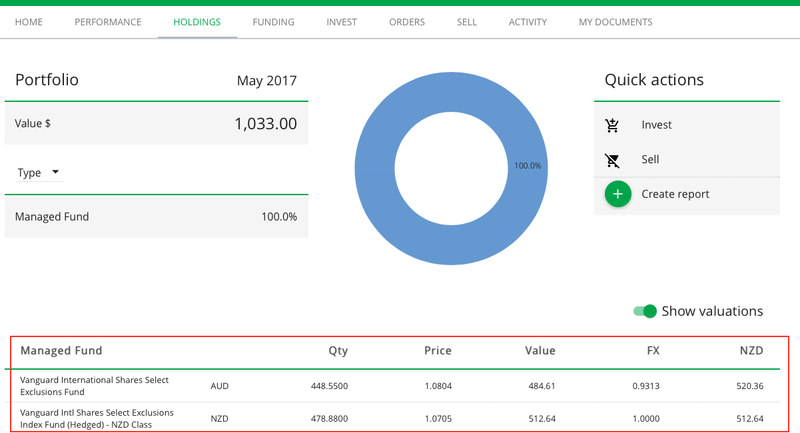 They invest in financial products listed on the NZX Main Board and is designed to track the return on the S&P/NZX 50 Portfolio Index. You are basically investing in the 50 biggest companies on New Zealand Stock Market. The concept is simple and easy to understand, so this is a great starting point for beginners. One disadvantage is this ETF is not as diversified as others because it is only invested in 50 companies in one country while other funds invest in between 100 to 7000+ companies all over the world. On the other hand, investors can take the tax advantage on local investing. You only need to pay tax on dividends and no tax on capital gain. The management fee is 0.49%. Overseas Shares (Currency Hedged) Fund: This growth asset fund invests in shares in major stock markets all over the world via the Vanguard ETF. The number of companies included is over 7000. This fund is currency hedged, which reduces the currency fluctuations and exchange rate risk on the fund. The management fee is 0.48%. Make sure you have a good financial foundation before you start investing. 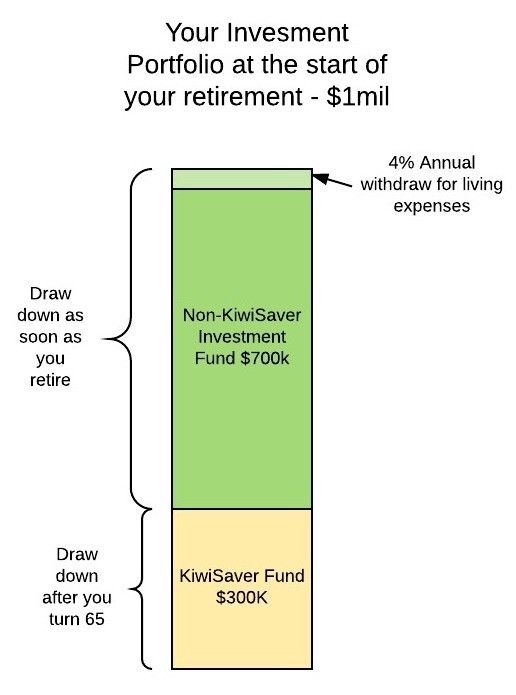 Clear your consumer debt, Join KiwiSaver, have an Emergency Fund and live on less than you make. If you don’t have a plan, start small while you make your plan. The hardest part is getting started. By starting small, you make the first step so much easier. SuperLife is the best place to start your investment in my opinion because there is no initial requirement, and it is diversified, low-cost, flexible and straightforward. Start small and START NOW! 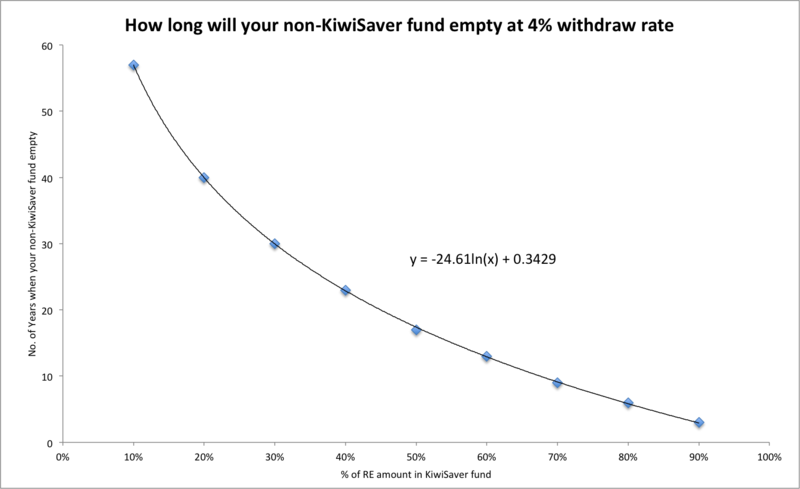 Last Friday I wrote about investing Simplicity non-KiwiSaver fund via InvestNow from as little as $250. However, I am sorry to say this opinion is no longer available. Simplicity decided to cease offering on InvestNow. You can read the statement from InvestNow here. I am personally disappointed as this is a great way for anyone to invest in a quality low-cost fund with a low initial investment. I was planning to invest in Simplicity fund but I don’t have the fund until next month, so I missed out on that. What does it mean for the investors? If you are InvestNow user and you already invested your money into Simplicity fund via InvestNow, you will be able to hold your investment in the fund, but you will not be able to make new investment. For those who wanted to join Simplicity Fund but don’t have $10k available, you will have to keep saving until you reach $10k…. or not. Hear me out! If you have some money to invest now, you don’t have to wait. I would suggest you invest those fund elsewhere rather than save for months and years to reach $10K. I know Simplicity fund is excellent, and I may even say it’s the best fund in this country. However, that is just the best fund when you have $10k or more. It doesn’t mean you can’t invest in anything else before you come up with $10K. 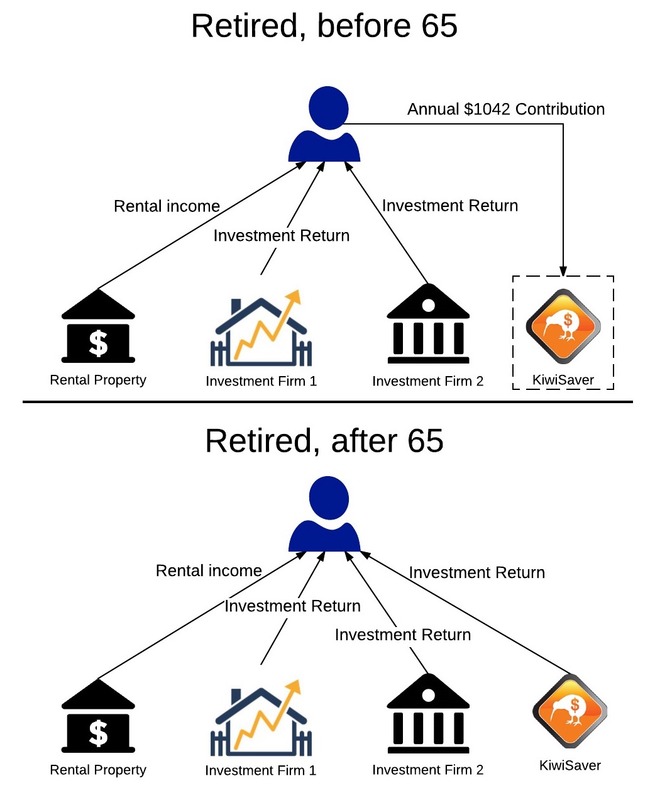 You can invest in Superlife 80, which is similar to Simplicity growth fund. Superlife 80 holds 80% growth asset (Share, property) and 20% income asset (Bond, cash). They also invested in Vanguard fund and ETF. Superlife a higher management fee (0.50%) and small annual fee ($12). The most important thing is there is no minimum initial investment requirement. If you are young and happy with the risk, you can go with Superlife 100, a managed fund with 100% growth asset, something Simplicity do not offer. If you already put the money in InvestNow, you can invest in their Vanguard fund with just 0.26% fee. Simplicity Growth invested 60% into that fund (and you will have to pay tax on dividends received). I’ve done a blog post on that. My point is, there are lots different opinion for investor out there. Don’t let that $10K hurdles stop you and start investing. You will reach $10k before you know it. 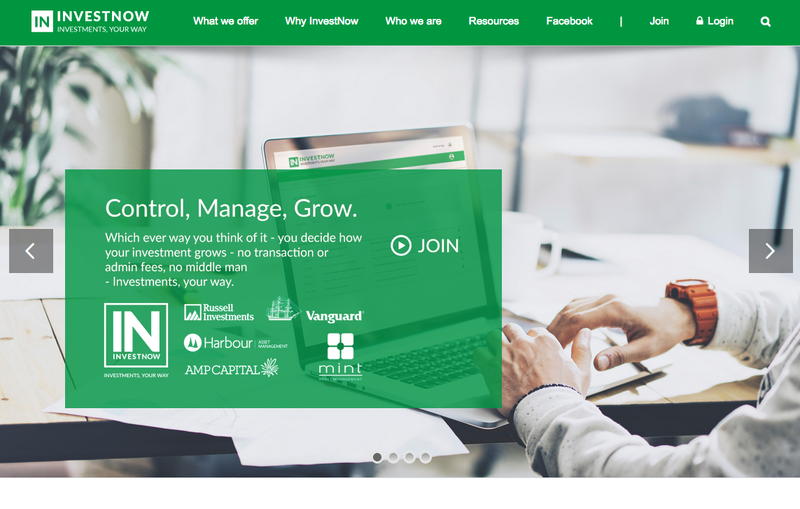 Investnow is a new online investment platform and fund management service just started this year in New Zealand. It is NOT an investment firm but a marketplace for investment funds. Kiwi investor can directly invest into the selected fund on investnow platform without the middle man. I’ve done some research on the company and invested some money via the service. Here are my findings. Investnow offers 33 different investment funds from both local and international fund manager. The investor needs to deposit minimum $1000 $250 into Investnow transaction account and invest into the fund on their platform at $250 minimum. 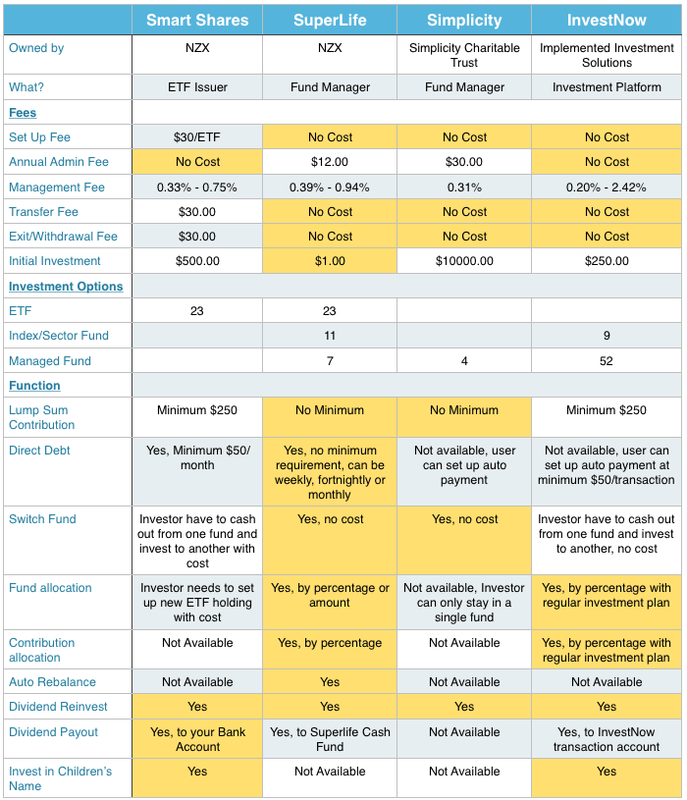 The main selling point for Investnow is no transaction/admin/Joining/Setup/Exit fee at all. When you put $1000 $250 into Investnow, Investnow won’t charge anything on your money. You can invest that full $1000 $250 into different funds. You only need to pay the cost of each investment fund. Investnow made their profit by charging investment fund providers to list their funds on their platform. Since investor can contact most of those investment funds directly and set up an account, no transaction/admin fee is not a real selling point here. For me, the real selling point for Investnow is low barriers to entry and Vanguard fund. If you want to invest into those funds directly without Investnow, the majority of those funds have a minimum initial investment amount from $2000 to $500000. For example, Fisher Fund’s International Growth fund require minimum $2000 initial investment and Mint asset management’s Australia New Zealand Real Estate Investment Trust minimum investment is $5000. If you invest from investnow platform, you can put only $250 into those funds. It dramatically lowers the entry requirement for those funds and makes it more accessible to the average retail investor. 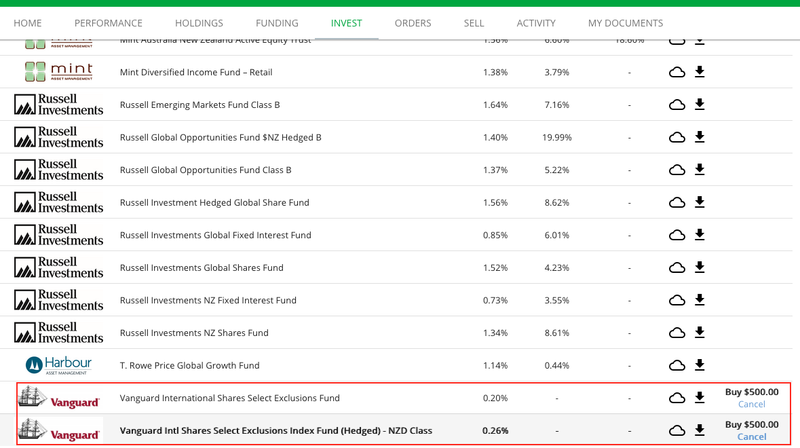 The most significant benefit with investnow (for me at least) is you got access to Vanguard International Shares Select Exclusions Index Fund. That fund launched for AUS and NZ market in late 2016. It contains about 1500 listed companies across 20 developed international markets (without Australia). This fund is an ethical fund as they excluded Tobacco, controversial weapons and nuclear weapons investment. Simplicity Kiwisaver invests heavily into this Vanguard fund. 61% of Simplicity Growth fund invested in Vanguard International Shares Select Exclusions Index Fund. There are two versions of this fund. Vanguard International Shares Select Exclusions Index Fund has a low managed fee at 0.20%. The Fund is exposed to the fluctuating values of foreign currencies, as there will not be any hedging of foreign currencies to the Australian dollar. So this fund has a higher risk due to foreign exchange fluctuation. Vanguard International Shares Select Exclusions Index Fund – NZD Hedged are hedged in New Zealand Dollar with a higher management fee at 0.26% but with lower risk. For individual investors, if you want to invest into this fund directly, you will have to start with $500,000 AUD. Investnow lower that entry barrier down to just $250. In my opinion, this is a great fund to invest because of the low-cost, diversified portfolio and low barriers to entry. Everything sounds good, so what’s the catch? Yes, there one thing not so good about Investnow. You’d need to do your tax return if you invested in Vanguard funds. Admittedly, I am not good at tax. So the following information may be wrong. From what I understand, those two Vanguard funds are not the same with other listed fund on their platform as they are not PIEs fund. Vanguard funds are Australian Unit Trusts. Accordingly, they are taxed under the FIF rules (that apply to global shares). Investors need to do their own tax return. Investnow produces consolidated tax information to help investors to complete their own FIF tax return. 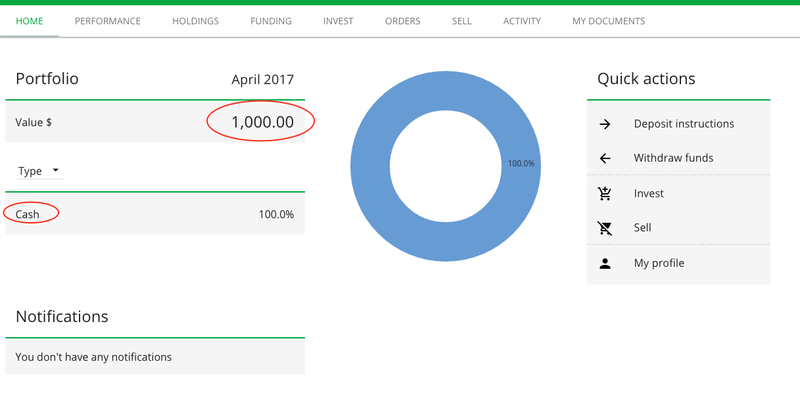 After some research and background check on the company, I invested $1000 into Investnow and tested it out. The sign-up process was quite simple; I managed to complete in 5 mins. The interface is easy to understand. The funding and investing took 1-2 days to complete. You can check out your holding and performance any time. One thing worth mentioning is Investnow use a Two-Factor Authentication for login. You need your username, password and a six-digit passcode that send to your email or phone to log in. I recommend using your phone to received that passcode in txt. InvestNow is free to join. You don’t have to deposit $250 to become a user. You can just sign up with an email address and check out the offering. Investnow is a new company; some investor will (and they should) question the legitimacy of the company/service and the safety of their investment. I’ve done research on that and I will share that in the next post. ETF is similar to an index fund that tracks an index, a commodity, bonds, a sector or a basket of assets. However, ETF can be traded on the stock market like any other stock. ETF shareholders are entitled to a proportion of the profits, such as earned interest and dividends paid. Since ETF is a share, i. In order to get the money out, you will have to sell your ETF in the stock market, just like any other stocks. This brings us to Liquidity of a share. Liquidity means how easy for you to sell your share into cash on the stock market. If lots of people wanting to buy that share and lots of willing seller on the market, the liquidity is good. We use trade me as an example here. If you are selling a brand new iPhone on trade me at a price closed to everyone else is selling, you will be able to sell that iPhone quickly. Also, you can use similar amount cash to buy an iPhone on trade me without any problem. So the liquidity of an iPhone is good on trade me. However, if you want to sell an expensive and rare antique phone on trade me, it may take months and multiple listing to sell that phone. You may have to lower your price to get it sold. It also hard to find another expensive and rare antique phone on trade. So, the liquidity of an expensive and rare antique phone is bad. 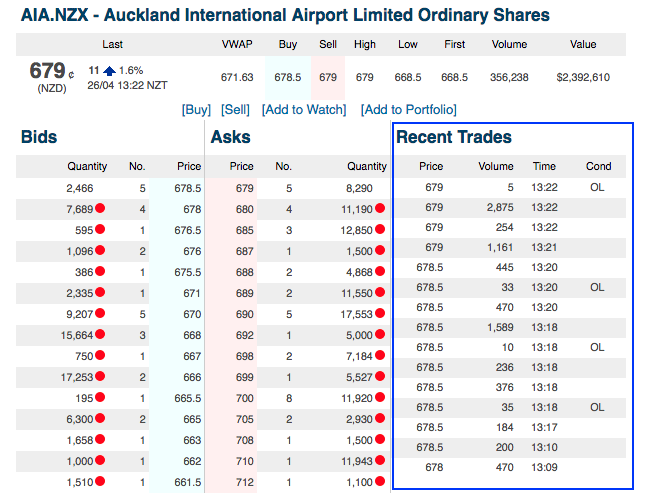 Let’s take a look at Auckland International Airport’s stock info. 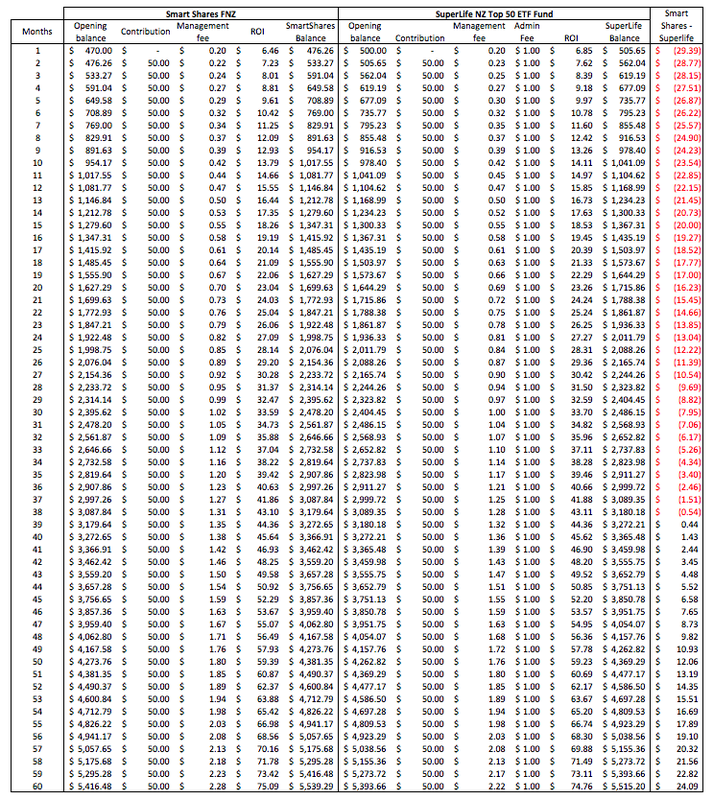 You can see there is lots of buying (Bids) and selling (Asks) order. Lots of trade happened in 13 mins. The different between buy and sell price (a.k.a. Bid-Ask Spread) is only $0.5c. Now compare that to Delegat Group Limited’s Share. There are some buy and sell order, but there was no trade at all. The different between buy and sell price is $10c. There is a seller want to sell 2000 units of share at $6.25, but there is no one taking that offer. If the owner of that 2000 share intends to liquidate the stock quickly, they will have to lower their selling price by $10c to $6.15 to meet the closest bid. That is $200 less on 2000 share. If you are an owner of Auckland International Airport share, It will be very easy to liquidate your stock in a short time. On the other hand, if you hold shares in Delegat Group Limited, you will have to wait or lower your price for someone to buy your share. Here is the info on two popular SmartShare ETF, NZ Top 50 and US S&P 500. Both of them have a good amount of bid/ask and the spread is small. Therefore, the liquidity is good. Also, there is a market maker for all Smartshare ETF. A market maker is an investment firm that guarantees liquidity of stock by putting out buy and sells order on the stock market. They make sure investor can always buy or sell the shares. The Bid and Ask below are the market maker order. At December 2014, SmartShares appoints Craigs Investment Partners as the market maker. Craigs will offer two-way quotes of agreed minimum volume and maximum spread for an agreed minimum period of the full trading day. This will cover all current Smartshares ETFs, plus future ETFs launched by Smartshares. With a market maker on all Smartshare product, its very easy to liquidate your Smartshares holding. However, you will need a stock broker to sell your shares. Especially for those who purchase Smartshares via monthly contribution plan since you don’t need a broker account to do that. Smartshare is not an investment fund, they will not cash out the ETF for you. Lots of people don’t know that. In order to sell your Smartshare ETF, you will need a broker to put your holding on the stock market. 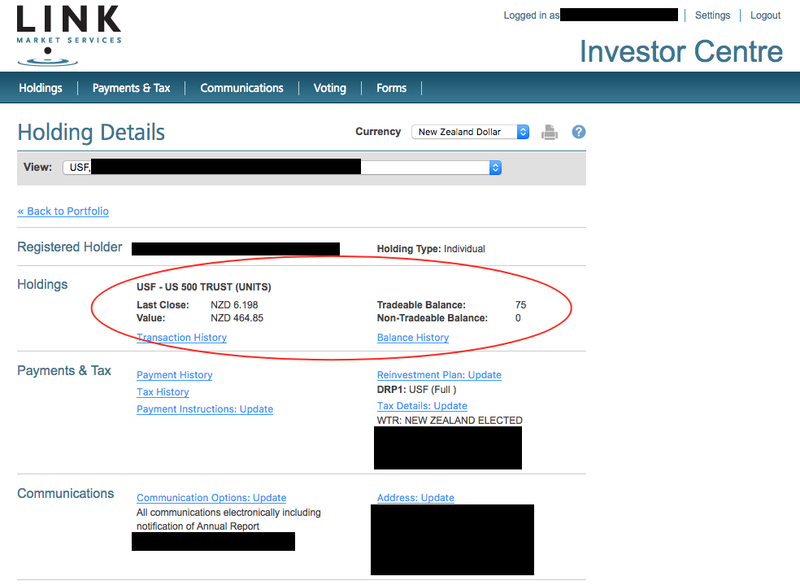 You can google “Stock Broker NZ” to contact any broker firm and set up an account. The cheapest way for most people is to use ASB and ANZ securities to trade online. ANZ cheapest rate is $29.90/trade under $15000. However, you have to be an Online Multi-Currency Account (OMCA) holders with sufficient cleared funds available to fully cover the purchase of securities prior to submission of the order. Otherwise, ANZ charge $29.90 + 0.40% on trade. If you are not an OMCA holder with ANZ, go with ASB Securities, they charge $30 or 0.30% per transactions, whichever higher. If you currently hold SmartShares ETF and don’t have a brokerage account, do it ASAP. You never know when you need to sell you share in a short period. It will take 2-10 days to set up account with ASB and ANZ. If you starting a monthly contribution plan with SmartShares, make sure you open a brokerage account as well.